clever use of space in small, medium and large bedrooms. Boys and girls any age will find the perfect solution to create their modern, up-to-date retreat. Along with kids furniture, our other main goal is to design space saving furniture solutions for small houses, vacation homes, studio apartments and tiny guest rooms. Our collection also features living room and bedroom furniture pieces: shelves, bookcases and home office units, beds, nightstands and chest of drawers, wardrobes and closet systems. modern, multifunctional and innovative solutions. In order to meet both parents and their young ones needs, our designs are always updated and in line with new trends. You just have to browse through our completely customizable bedroom sets, murphy beds, convertible wall units and hundreds of colours, materials and handles. We promise you will only find Italian bedrooms and space saving furniture packed with style and smart design. Our kids bedroom sets offer flexible furniture solutions that fit around your children's lifestyle and needs. You will find endless ideas for your kids and teen bedrooms, no matter the size and shape of the room: low single and cabin beds, storage, wardrobes, bookcases, shelves and desks for the perfect work and study space. Browse all our kids bedrooms with bridging units and get ready to use the space in a super-clever way. Simply loved by teenagers, a large overbed wardrobe is a true space saver. Under the floating cabinets you can put one or two beds, but teens will definitely love a grand study area for their computer, TV and game console. 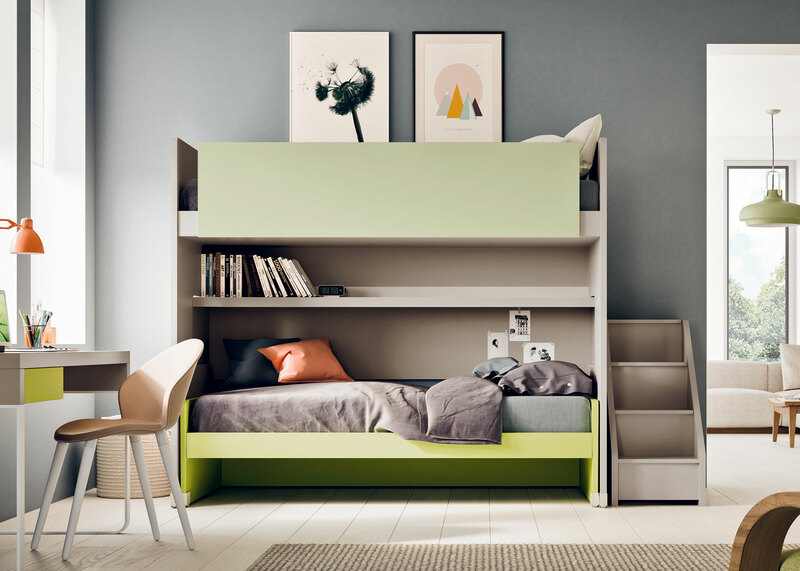 Go for a space saving solution and make your children's room a place to rest, have fun and grow up. The perfect solution for siblings, our kids bedrooms with bunk beds offer smart cabin beds, trundle beds and loft beds with desk and storage. Complete them with stairs and many cool accessories in an endless colour choice, for girls and boys. Make the most of your living room, guest room, bedroom or studio apartment with our multifunctional furniture. The ultimate solution, space saving furniture transforms any small space through multipurpose solutions like murphy beds that incorporate sofas, tables, storage and shelving. Beds for kids' bedrooms: low single bed frames, cabin and trundle beds, high sleepers and bunk beds. All you need for a tidy children's room: kids storage, bedside tables and chest of drawers. Wardrobes and closet systems for kids, the perfect choice for a teen girl or teenage boys bedrooms. Colourful, modular, modern: our bookcases are made to house all your kids' books. Create the perfect study area with these kids desks are suitable for boys and girls any age. Complete the study area with one of our chairs for kids designed for studying and playing. Finding the right furniture for a small room can be challenging. In this guide you will find some ideas on what to do if you are dealing with a tiny room but you are determined to create a functional and beautiful space. New kids furniture collection now live! Start. 20.20 - Smart Design For Young People collection features lots of new bedroom sets for modern girls and boys. Browse through new exciting space saving solutions.